Red Queen started out a little slow for me. There was so much hype surrounding this novel, and I think I went into it thinking, "this is going to be my favorite book of the year". So I probably messed that one up for myself, oops! My concerns for a slow plot were quickly dusted away and I soon became engrossed in the characters and the story. The main character Mare is a tough, entertaining, and witty character who fights for what she believes in and wants to protect her family at all costs. I really enjoyed her character and the relationships that she easily formed with other characters in the novel. She was easy to like and it wasn't difficult to see why a lot of characters loved her and several hated her. 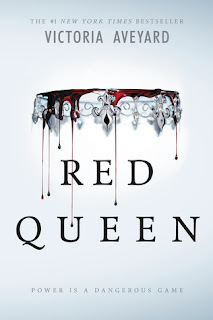 Red Queen was full of plot twists, intense fight scenes, and several romantic moments that made it increasingly entertaining from one page turn to the next. I throughly enjoyed this novel and look forward to reading Glass Sword. I would highly recommend this book to lovers of YA fantasy books. It was a fun and quick read, and there are two more books in the series.